This document is a technical summary of the Federal Highway Administration report, Safety Effectiveness of the HAWK Pedestrian Crossing Treatment, FHWA-HRT-10-042. While several roadway treatments are available to address pedestrian concerns, only a few are appropriate for high-speed or wide-crossing conditions. The HAWK beacon was developed to address these conditions. At a HAWK crossing, drivers receive multiple cues to emphasize the potential presence of a pedestrian. These cues include a unique configuration of the HAWK beacon (two red lenses over a single yellow lens), high-visibility crosswalk markings (ladder-style markings as opposed to only two transverse white lines), a stop bar approximately 50 ft from the crosswalk, 8-inch solid lane lines between through travel lanes, signs that can be illuminated and read "CROSSWALK," and School Warning signs. When activated, the HAWK uses a red indication to inform drivers to stop, thereby creating a time period for pedestrians to cross the major roadway. Figure 1 shows an example of the current head configuration for the HAWK. At the time of this study, HAWKs were used at more than 60 locations in Tucson, AZ. Figure 1. Photo. Example of a HAWK treatment in Tucson, AZ. The HAWK beacon is not illuminated until it is activated by a pedestrian, triggering the warning flashing yellow lens on the major street. After a set amount of time, the indication changes to a solid yellow light to inform drivers to prepare to stop. The beacon then displays a dual solid red light to drivers on the major street and a walking person symbol to pedestrians. At the conclusion of the walk phase, the beacon displays an alternating flashing red light, and pedestrians are shown an upraised hand symbol with a countdown display informing them of the time left to cross. During the alternating flashing red lights, drivers can proceed after coming to a full stop and checking that pedestrians have already crossed their lane of travel. Each successive driver is legally required to come to a full stop before proceeding during the alternating flashing red phase. The alternating flashing red phase allows the driver delay to match the actual crossing needs of the pedestrian. Drivers can proceed with a stop-and-go operation during the flashing red phase if a pedestrian walks faster than the assumed walking speed and clears the lanes or roadway, as appropriate. If pedestrians need more time, then the drivers remain stopped until they finish crossing. The ability to balance the needs of the pedestrians with driver delay is a valuable component of the HAWK treatment. Concerns have been expressed regarding driver behavior and understanding of the dark phase (not illuminated) and the flashing red phase. Experiences in Tucson, AZ, have demonstrated that, with proper education and with experience, drivers understand when they should stop and when they should resume travel. The city has conducted public campaigns and increased enforcement to teach and encourage appropriate driver and pedestrian behavior at HAWK crossings as well as at all pedestrian crossings. All 21 HAWKs included in this study were located either at a minor intersection (where the minor street was controlled by a STOP sign) or at a major driveway (where the driveway was controlled by a STOP sign). The 2009 MUTCD includes an R10-23 sign with the symbolic red circle and a white background for the crosswalk section of the sign. (4) The signs typically used at the HAWK locations in Tucson, AZ, do not have the symbolic red circle, and the background is yellow for the crosswalk section of the sign. The first step in the before-after EB method was to develop and calibrate safety performance functions (SPFs) using data from a reference group. Development of the SPFs involved determining which predictor variables should be used in the model, how variables should be grouped, and what model form should be used. The major street and minor road average daily traffic (ADT) values are often the key variables in developing SPFs for intersections. In addition, pedestrian volumes are likely to play an important role in pedestrian crashes. To account for additional intersection-to-intersection variability (other than that caused by the differences in traffic volumes and pedestrian volumes), intersection type, median refuge presence, number of lanes, and major street speed limit were also considered in the SPF predictions. The city of Tucson, AZ, provided the research team with a list of all HAWKs that were installed or planned. Sites planned or installed less than 18 months prior to this study were not evaluated. Only sites with the current head configurations (see figure 1) that were newly installed (21 locations) were included in the before-after study. The previous head configuration had a similar appearance as a vertical traffic signal. Crash evaluations benefit when a reference group of similar sites without treatment is identified. Researchers identified two potential reference groups–reference group 1 and reference group 2–and derived the safety effectiveness estimate for HAWKs using each reference group. Reference group 1 included 36 signalized and 35 unsignalized intersections. Because of concerns with including signalized intersections, reference group 2 was developed and consisted of 102 unsignalized intersections. For the before-after study, the goal was to have 36 months of before data and 36 months of after data. The before period reflected month 38 to month 2 prior to the installation date of the HAWK. The calculations assumed 2 months prior to the installation date as construction. The 2 months following installation of the HAWK were assumed to be a learning period for drivers to become familiar with the treatment. The after period occurred 2 to 38 months following the installation of the HAWK or until December 31, 2007, which was the limit of crash data available. The number of months in the after period for the 21 HAWK sites varied depending on when the HAWK was installed. The majority of the sites had a 32-month or greater after period, with more than 80 percent of the sites having at least a 28-month after period. Reference group sites had the same time period in their before and after periods as their corresponding HAWK site. Intersecting street name (ISN) crashes were identified by matching the street names for the intersection. IR crashes were identified as the crashes in the ISN crash dataset with "yes" for the IR code. Total crashes included all crashes identified. Severe crashes included all crashes with an injury severity code of possible injury, nonincapacitating injury, incapacitating injury, or fatal injury. Pedestrian crashes included all crashes with the type of collision coded as pedestrian. In developing the SPFs, the crash counts at reference sites can be treated as aggregated data over the entire study period (including both the before and after periods) or as disaggregated data with two crash counts from each intersection–one for the before period and one for the after period. Aggregating the data is one way to account for the correlations that might be present in the crash counts when the intersections are included twice (once for the before period and once for the after period) in estimating the SPFs. Disaggregating the data provides the opportunity to account for a general time trend (if any exists) within the two periods. For the disaggregated data, it is desirable to use the generalized estimating equation approach in estimating the SPF coefficients to incorporate the potential correlation in the before and after crash counts from the same intersection. Both approaches were explored in this study. Table 1 summarizes the number of crashes by control type. HAWKs are installed to assist pedestrians in crossing the roadway; therefore, installing the device should have a notable impact on pedestrian crashes. The impact on total or severe crashes is not as intuitive. Using IR crashes, the HAWK sites experienced a decrease in the total crash rate of about 35 percent after installation. The 102 unsignalized intersections in reference group 2 experienced a 9 percent decrease, and signalized intersections in reference group 1 had a 17 percent decrease. These observations indicate that citywide conditions may have contributed to the reduction in crashes since all types of intersection control showed reductions in total IR crashes. The HAWK sites experienced a large decrease of 86 percent in the pedestrian IR crash rate after installation. The 102 unsignalized intersections experienced an increase in pedestrian crashes of 143 percent. Therefore, if citywide conditions were contributing to reductions in total crashes, these conditions were not having the same impact on pedestrian crashes, or other factors were contributing to a rise in pedestrian crashes at unsignalized intersections but not at signalized and HAWK intersections. From table 1, it is observed that HAWK locations have crash rates higher than unsignalized intersections. For this dataset, the HAWK locations were associated with a slightly greater number of crashes per million entering vehicles and pedestrians, as compared to the nearby unsignalized intersections. This observation does not imply that if the HAWK was removed, the crash rate for a given intersection would be similar to the crash rate identified for the neighboring unsignalized intersections. When the sites were unsignalized intersections (i.e., before the HAWK was installed), the crash rate at the sites exceeded the crash rate for nearby unsignalized intersections. Therefore, conditions at the HAWK locations before the treatment was installed were generating crashes in greater numbers than the unsignalized intersections. This indicates that those intersections were associated with conditions that resulted in a higher number of crashes. Addressing those conditions with a HAWK resulted in a decrease in total crashes and a large decrease in pedestrian crashes. The following section provides the findings from the statistical evaluation. Table 1. Crash data for before-after study by groups. Crashes/MEV&P = Type of given crash (total, severe, or pedestrian crashes) per million entering vehicles and pedestrians. Pedestrian crashes/MEP = Pedestrian crashes per million entering pedestrians. Note: Frequency is expressed as the average annual number of total crashes for a site with the given intersection control and study period. To account for the effects of variables in crash reduction as well as the potential regression-to-the-mean bias, the EB approach was employed to identify the safety effectiveness of the HAWK treatment. The corresponding main report includes the reasonable SPFs identified in this study. (3) Although the magnitude of the safety effectiveness estimate varied to some extent as different predictors were included in the SPFs, the results did not seem to change materially. Table 2 summarizes the percent reduction and whether the finding was significant at the 95 percent confidence level from the different approaches used in evaluating the HAWK beacon. The results for total crashes were similar regardless of the approach used to evaluate the data. The reduction was about 16 percent for ISN crashes (14 to 19 percent) and 27 percent for IR crashes (23 to 29 percent), all of which were significant at the 95 percent confidence level. There were similar results for pedestrian crashes, with the disaggregate approach resulting in higher reductions (65 or 69 percent) than the aggregate approaches (between 51 and 59 percent). As seen in several evaluations, severe crash results were not at the desired confidence levels. The smaller sample size probably affected the results. Although the safety effectiveness estimate did not change significantly with which reference group was used, reference group 2 was chosen as the more appropriate reference group, since in most cases, the HAWK was installed at a previously unsignalized intersection. Three types of crashes (total, severe, and pedestrian). Two methods for identifying crashes (ISN and IR). Two reference groups (reference group 1 with 36 signalized and 35 unsignalized intersection and reference group 2 with 102 unsignalized intersections). Two ways to combine the reference group before and after data (aggregated and disaggregated). The crash prediction during the before period was calculated from SPFs and combined with the observed crash count for the before period by using a weighted average to control for regression-to-the-mean bias. This weighted average was adjusted for differences in duration and traffic volumes (and general time trends if any existed) between the before and after periods. This lead to a crash prediction for the after period had the treatment not been applied. EB then compared this predicted value to the observed crash frequency for the after period. Two crash datasets were used in the before-after evaluation. In theory, the IR crash dataset should have better represented those crashes that would be affected by the traffic control at the intersection. A closer review revealed that the IR code was not used in over a 1/3 of the crashes; therefore, too many crashes may have been eliminated. The ISN crash dataset, however, may include crashes that are not related to the traffic control. Therefore, both datasets were considered. The IR crashes were considered as the more appropriate dataset for total and severe crashes. The ISN crash dataset, however, may be more representative of the change in pedestrian crashes since the HAWK device could induce pedestrians to walk an additional distance to benefit from an activated traffic control device. There was a 29 percent reduction in total crashes, which is statistically significant at the 95 percent confidence level. There was a 69 percent reduction in pedestrian crashes, which is statistically significant at the 95 percent confidence level. There was a 15 percent reduction in severe crashes, which is not statistically significant at the 95 percent confidence level. The prime objective of a HAWK is to provide pedestrians with safe crossing opportunities. As such, a reduction in pedestrian crashes would be expected to be associated with the HAWK, and a statistically significant reduction in pedestrian crashes was found. The installation of the HAWK was also found to be associated with a statistically significant reduction in total crashes. It should be noted that the HAWK treatment, just like any other warning traffic control device, may not work as effectively if it is overused. In addition, such high crash reductions identified in this study may not be achieved at future locations if the site has different characteristics, such as less pedestrian activity. Nassi, R.B. and Barton, M.J. (2008). "New Traffic Control for an Old Pedestrian Crossing Safety Problem," APWA Reporter, 44–49. Fitzpatrick, K., Turner, S., Brewer, M., Carlson, P., Lalani, N., Ullman, B., Trout, N., Park, E.S., Lord, D., and Whitacre, J. (2006). Improving Pedestrian Safety at Unsignalized Crossings,TCRP/NCHRP Report 112/562, Transportation Research Board, Washington, DC. Fitzpatrick, K. and Park, E.S. (2010). Safety Effectiveness of the HAWK Pedestrian Crossing Treatment, FHWA-HRT-10-042, Federal Highway Administration, Washington, DC. Federal Highway Administration. (2009). Manual on Uniform Traffic Control Devices (MUTCD). Obtained from: http://mutcd.fhwa.dot.gov/kno_2009.htm. Site last accessed March 5, 2010. Tucson Department of Transportation. Traffic Data for the City of Tucson, Tucson, AZ. Obtained from: http://www.dot.ci.tucson.az.us/traffic/adt.cfm. Site last accessed June 26, 2008. Pima Association of Governments. Traffic Volumes Map, Tucson, AZ. Obtained from: http://www.pagnet.org/RegionalData/TransportationTrendsandData/TrafficVolumes/Maps/tabid/446/Default.aspx. Site last accessed June 26, 2008. Researchers – This study was performed by Kay Fitzpatrick and Eun Sug Park, both of the Texas Transportation Institute, which is a member agency of The Texas A&M University System. Availability – This TechBrief may be obtained from the FHWA Product Distribution Center by e-mail to report.center@dot.gov, fax to (814) 239-2156, phone to (814) 239-1160, or online at http://www.tfhrc.gov/safety. 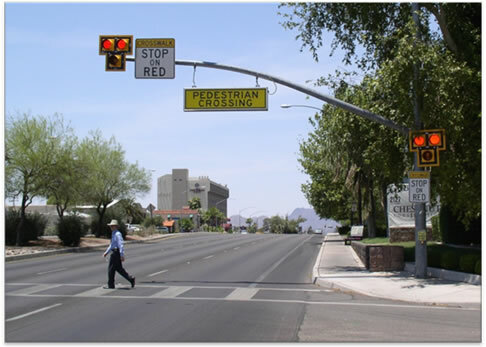 Key Words – HAWK, Pedestrian treatment, Pedestrian crashes, Unsignalized intersection, and Pedestrian hybrid beacon. Notice – This document is disseminated under the sponsorship of the U.S. Department of Transportation in the interest of information exchange. The U.S. Government assumes no liability for the use of the information contained in this document. The U.S. Government does not endorse products or manufacturers. Quality Assurance Statement – The Federal Highway Administration (FHWA) provides high-quality information to serve the Government, industry, and public in a manner that promotes public understanding. Standards and policies are used to ensure and maximize the quality, objectivity, utility, and integrity of its information. FHWA periodically reviews quality issues and adjusts its programs and processes to ensure continuous quality improvement.